This Halloween, Kristen Frederick, congressional liaison for the Architect of the Capitol (AOC), visited the Congressional Cemetery and discovered many connections the AOC has to this hallowed ground. While the U.S. Capitol has plenty of ghost stories and legends galore, no one is actually buried in the building — even though it contains a room called the Crypt! The Congressional Cemetery, on the other hand, has thousands of dead souls resting in its 35 acres of grounds. Never heard of the Congressional Cemetery? You wouldn't be the first. Nestled in the far eastern edge of what's known as the Capitol Hill neighborhood (and known to locals as the Hill East area), Congressional Cemetery contains more than 55,000 gravesites, and many of them contain famous or noteworthy permanent residents. The two men recognized as the first and second Architects of the Capitol have direct connections to the Congressional Cemetery. In fact, the first Architect of the Capitol, William Thornton — whose U.S. Capitol design was chosen by George Washington — is buried there. 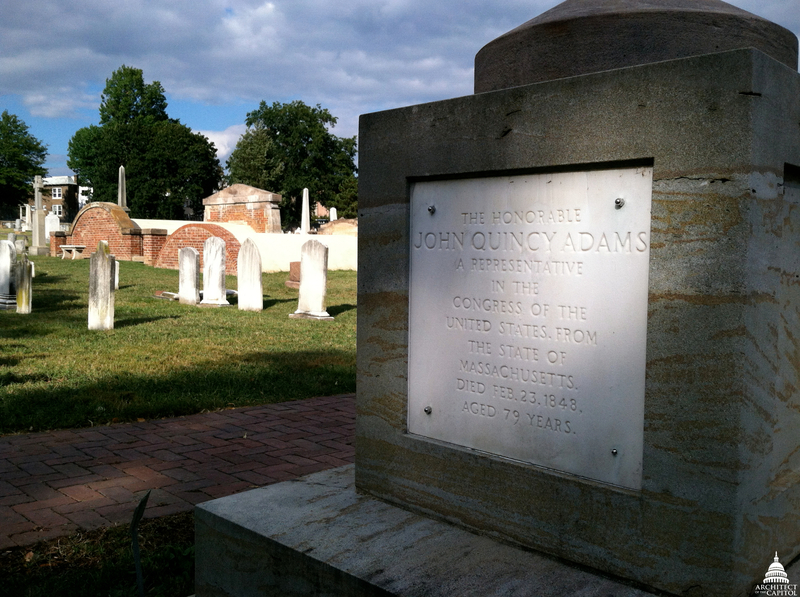 Cenotaph honoring John Quincy Adams at the Congressional Cemetery. The second Architect of the Capitol, Benjamin Henry Latrobe, designed the cenotaphs, or sandstone commemorative markers, that honor congressmen who died in office and are on display at the Congressional Cemetery. These cenotaphs are in many cases simply monuments and do not mark a burial place of a member of Congress; approximately 60 bodies are interred beneath the more than 160 cenotaphs that can be found throughout the cemetery. They are made of Aquia Creek sandstone, the same material originally used for the exterior of the U.S. Capitol. Legend has it that in the late 1870s these cenotaphs fell out of favor when Massachusetts Senator George Hoar remarked that being buried beneath one would "add a new terror to death." Other architects buried at Congressional Cemetery with ties to the U.S. Capitol include Robert Mills and George Hadfield. Mills was a noted Washington architect who assisted in providing minor architectural services at the Capitol between 1829 and 1851, during a time when there was no Capitol architect and the Commissioner of Public Buildings directed the building's maintenance. This is really neat. I have lived in the DC area all my life and never knew there was a Cognressional Cemetery. I found this blog very interesting and informative. I, like Katie, also did not know that this existed. I might have to check it out the next time I'm in that area of the city before a DC United game!